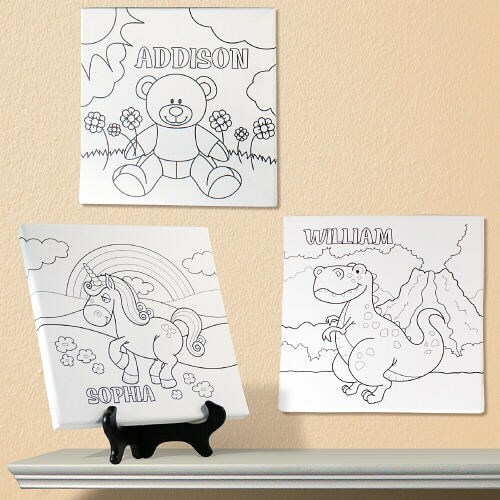 Our Color Me Canvas is a perfect way to show off your kids creativity. It makes a fun addition to our plush animals and makes a wonderful gift for all occasions. The canvas may be hung on the wall or you may wish to add our optional easel for table display, sold separately. The canvas has gallery wrapped edges so it is perfect to display with or without a frame. Measures 10" x 10" and includes a free watercolor paint set that features twelve beautiful, vivid non-toxic watercolors. Contained in a sturdy carrying case with a built-in handle, the lid doubles as a mixing tray! Deluxe brush included! Dimensions: 0.5" x 4.5" x 6" Packaged. Free personalization of any name and design is included. Additional Details 800Bear.com is your home for all Plush Animal Gift Ideas. Shop our large variety of gifts for all occasions. Our Plush Birthday Animals are perfect for any style and any age!